I've been saying pretty much from the start that eventually there will be dual format HD DVD/Blu-ray players. But I wasn't expecting it for maybe three or four years. Well, the pace of technological improvement continues to accelerate, and already there is a hybrid HD DVD/Blu-ray player from LG (in the United States, anyway). Apparently the LG BH100 is less than perfect, but that's unimportant. What is important is the proof of concept. Meanwhile, Warner Bros (which supports both HD DVD and Blu-ray) has announced a new hybrid disc with both HD DVD and Blu-ray content. If these work okay that will deal with the one remaining problem of the two formats: inventory management. Some years ago I received a DVD player for review. Before I had a chance to get it out of the box, I received a call from the PR company. The previous reviewer had accidentally left a DVD in it, so could I post it to him? Sure, not a problem. In case that reviewer happens to be reading this, don't worry: I can't remember who you are, or even which particular brand of DVD player I was reviewing. You see, the said disc turned out to be an adult movie (I shall avoid the 'p' word so as not to tempt Net Nanny and the like to blacklist this site). Now I read that Sony apparently says it will not source its Blu-ray discs from disc replicators which also produce discs for the adult film industry. Apparently Disney has the same policy. I have been fairly dismissive of claims that either Blu-ray or HD DVD is significantly superior to the other. Blu-ray is perhaps a little more attractive because of the greater disc capacity. But so far it has largely negated that by using the MPEG2 video compression scheme for most releases (certainly, all that I've seen), rather than the more efficient systems available (all the HD DVD discs I've seen use the more highly developed, and much newer, VC-1 system). In order to achieve its higher capacity, the Blu-ray crowd have re-designed the discs themselves. DVDs, HD DVDs and BDs (Blu-ray Discs) are all 1.2mm thick. But DVDs and HD DVDs have their data half way down through the disc's thickness: that is, they have a 0.6mm layer of transparent plastic on top of the data. BDs have the data much nearer to the playing surface, just 0.1mm down. To overcome possible damage to the data from scratches and the like, BDs use a much harder plastic. This closeness of the data layer to the surface is what allows the higher data density. Toshiba has often touted the more traditional structure of HD DVDs as an advantage of its format. It argues, probably correctly, that current DVD production equipment can be used to produce HD DVDs, rather than the expensive new equipment required for Blu-ray. I haven't found this a persuasive argument because whichever the format, disc production costs are a tiny percentage of the release costs of any movie. But this story puts a new slant on it. If you have invested in expensive new equipment for BD production, would you be prepared to eliminate from your customer list both Disney and Sony (which owns the Columbia, TriStar and MGM movie catalogues) in order to press Blu-ray adult films? DVD production equipment, though, is relatively cheap. So expect high definition adult material to appear on HD DVD rather than Blu-ray. The more cynical may suggest that this will ensure the success of HD DVD and the eventual demise of Blu-ray. I doubt it myself, but it will be interesting to see what does happen. UPDATE (Wednesday, 11 April 2007, 12:22 pm): Looks like this isn't going to be the case after all. A couple of people have emailed me, politely I'm happy to report, wondering whether I'm ever again going to add something to this blog. For the past, ugghh!, four months I haven't felt inspired enough to add anything new here. I'll try to do better. 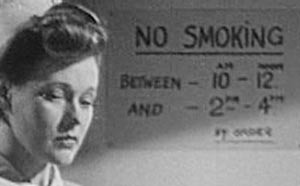 In the meantime, the other night I watched a movie on ABC called Green for Danger, a very good little murder mystery set in a war-time hospital in the UK. Well worth checking out, with brilliant dialogue by the Alistair Sims character. My eye happened on a scene set in the patient ward. Notice the sign tacked up on the wall. How times have changed. It was recently time for a retirement. Back in September 2000 I purchased a digital camera as an aide in my writing work. It was an Olympus C-3030Z. Three megapixels, decent quality optics, it cost around $2,000. Since then it has been to Bangkok, Hong Kong, Singapore, Los Angeles, London, Paris, Tokyo, Osaka, and a few other places, and served me well. But it was always a bit limited. I learned photography on a Pentax K1000 SLR (with which my eldest daughter is now also learning photography). Fully manual, it is the kind of camera you could still use after civilisation collapses, requiring no batteries at all. The Olympus was also getting a little cranky, had developed three crook pixels (which isn't bad out of three million and six years) and had always been a demon on batteries. 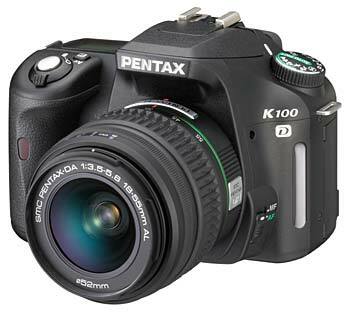 So I did my research and reverted to Pentax, in this case the K100D digital SLR. This was available as a package with a couple of Sigma lenses for around $AUS1,100. Why choose Pentax rather than Olympus or Canon or Nikon? Two reasons. The first is that it was cheaper. The second was that the closest price competition, from Olympus, uses a proprietary rechargable battery pack. I always feel far more comfortable knowing that, at a pinch, I can buy a stack of AAs just about anywhere in the world to keep on going. Of course I quickly added a couple of new sets of NiMH batteries (it takes four, and seems to deliver about 300 to 400 shots on a fresh charge), a backup set of Lithium batteries and a couple of SD memory cards. Between them, the 1GB and 2GB cards are good for around a thousand photos at the highest quality JPEG setting (good enough for my purposes, and the RAW format used by Pentax seems to be a peculiar, non-standard one). And then there was the issue of a flash. The K100D has a built-in pop up flash, which is okay I suppose in an emergency. But it is just no good at all for taking pictures of home entertainment equipment, producing bright reflections and such. A flash attached to the hot shoe, fitted with a swingable head, seemed to be the answer. So I made some more enquiries. Pentax makes a flash designed to work nicely with the K100D, but this was out of the question. Few shops carried it (one said that no-one buys it because it is too expensive), and the going price was upwards of $AU700. 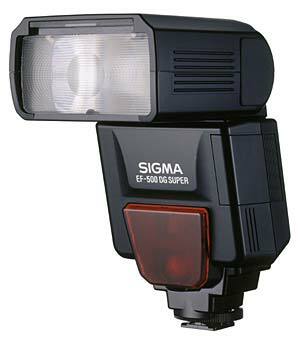 However Sigma makes flashes for most camera brands (the flash is the same, but the hot shoe is different to match the proprietary contacts), including the Pentax *ist and the K100D. The model is EF-500DGST. This offers proper Through-The-Lens metering, a low light focus assist, red-eye reduction pre-flash, automatic zoom (28mm to 105mm for 35mm film camera lenses) and a flash head that both swings up (and down a little for macro shots) and sideways so that you can bounce the flash for diffuse lighting. Just what I needed. As it happened, Ted's Camera Stores had a special on the flash: $AUS199 instead of the usual $299 (or more at some shops). So I raced in and bought one. And that's when things went weird. Once I got home, the flash worked beautifully ... when it worked at all. Oh, it always flashed, but sometime the exposure was so dark as to make me think that the sync failed and it had flashed either before the shutter had opened, or after it had closed. So then I did some experiments. The flash always worked properly if the aperture on either lens was set to less than F4.5. It also always worked properly if the head was significantly swivelled, or significantly swung up. 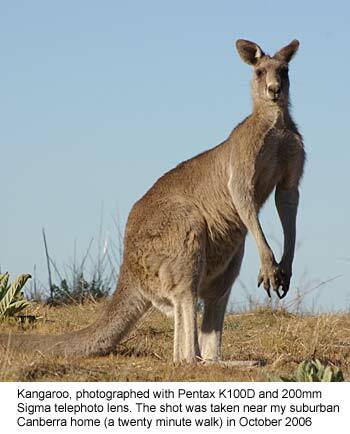 But if pointed directly at the subject, with an aperture of F4.5 or greater, it just would not work at all. How's that for strange! I reluctantly returned the flash and got my money back. Then I contact the distributor, which imports both Pentax and Sigma products. Their service department said promptly that this was a known issue. Both the camera and the flash needed to have their firmware upgraded. The Pentax I could do myself with a download (to version 1.1 from 1.0), but the flash had to have its done in their workshop. I rang Ted's and the chap who had been dealing with me regarding the flash agreed to send it back to Melbourne. A few days later it was done, and now it works perfectly. Anyway, I like this camera a great deal, and the flash allows me to capture equipment shots that were always beyond the capability of the Olympus C-3030Z. But if you are contemplating this combo, get an assurance that both products have the appropriate firmware, and try them out together in the shop. Now all I need is a cable to allow me to mount the flash away from the camera. Pentax makes the cable (and the attachments for either end for connecting to the camera's hot shoe and the base of the flash), but this was close to $AUS300. Ouch! Blu-ray has many wonderful things going for it, especially the sheer detail of the picture quality (more on this on another day). But one of the coolest things for me are the pop-up menus. 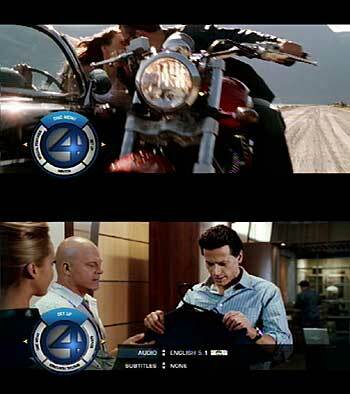 Blu-ray is capable of delivering three separate video layers. One of these is typically used by subtitles, so that leaves two. What do you do with them? Well, the main one can run the movie, while the other one can have pretty much anything over the top of it (including video commentary). So far, this has been used for popup menus. With DVDs you have to return to the main menu if you want to, say, access the scene selections or the language menu. With Blu-ray, you don't need to do this at all. Just hit the 'popup menu' key on the remote, and the main menu appears overlaid on top of the movie, even while it continues to run. FF is on a 20th Century Fox BD (Blu-ray disc). They have sent me three others: Kiss of the Dragon, Kingdom of Heaven and The Transporter. FF is implemented in a similar manner to DVDs, and to the Sony Pictures Entertainment discs I have acquired: it has the usual main menu which you enter when you start the disc. But the other three discs mentioned are different. When you insert the disc, it runs the 20th Century Fox logo, then it runs it again. But the second time, the logo is actually the start of the movie. Initially I thought it was skipping the main menu and running the movie immediately. But when I hit the menu key, I just got the red no-go crossed circle at the top right of the screen. Turns out that there are no main menus on these movies. Everything is done through the popup menus. Mind you, these are test discs, so the final product may be different. But that seems unlikely since everything else seems to be present on these discs.